That tumbling mass is really sea hare mating! Imagine the surprise of divers looking for critters at Sand Castle, one of Gorontalo’s muck diving sites. On the sand in shallow water were masses that looked like sea weeds, rocking back and forth in the gentle surge. In fact, there were patches of algae on the sea floor. That added to the confusion. But a closer inspection revealed a rarely witnessed event, sea hare mating. Sea hares are members an opisthobranch order of sea slugs. More colorful opisthobranchs are famously called nudibranchs. Their sensing organs are called rhinophores. In sea hares, these and their oral tentacles are rolled. Many sea hare species have an internal shell, giving them a pudgy appearance. These characteristics make the slug look like a rabbit, hence the name. Sea hares can grow to enormous sizes and weigh five kilograms or more. The sea slugs discovered by guests of Miguel’s Diving in the midst of sea hare mating were not of the large variety. 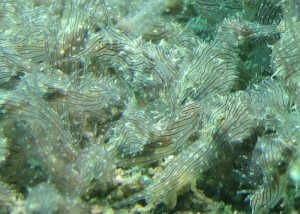 Instead, they were Lined Sea Hares (Stylocheilus striatus). Notice the fine dark lines in the photo by Senior Aldo Galante of Buenos Aires. Some light spots are also visible. This color pattern makes for great camouflage. Lined Sea Hares are usually quite small, such as the ones found in Gorontalo that day. But they can grow to up to 65 mm in length. Like other sea hares, Lined ones eat blue-green algae. When disturbed, most sea hares will secret purple ink. This purple secretion actually comes from toxins found in the blue-green algae eaten by sea hares. To witness sea hare mating is a rare event. Watch the video shot in Gorontalo that day. At the beginning of the video, there are several still photos. Can you make out the individual sea hares? Notice how the mass of sea hares resembles the clump of algae growing on a nearby rock. Do you see individual sea hares crawling from the upper left screen towards the sea hare mating frenzy? Notice the dark portion inside the body of a sea hare. This is the internal shell. A whale shark encounter was in store for two American divers. On their way to the Togian Islands, they made a last minute decision to make two dives in Gorontalo. That decision made memories to last a lifetime. Sadly, many travelers miss diving in Gorontalo on their way to its more famous neighbors, the Togian Islands, Bunaken Marine Park and Lembeh Straits. But world class diving is easily available here. After touch down at the airport, the ocean is only an hour away. Eight different dive sites are only fifteen minutes from the private dock of Miguel’s Diving. Over 30 named sites are available. The whale shark encounter captured in the video was at one of those close dive sites. It is named Swirling Steps because of a series of short drops and ledges that push into the current. Staff of Miguel’s Diving have forgotten the number of times we have seen whale sharks at this site. There have been too many over the years! In addition, this site has hard coral below 40 meters, which indicates the vibrant health of Gorontalo reefs. Only in Gorontalo can diver see Salvador Dali sponges with their surreal, carved surfaces. [svpVideo v=1]Watch the video shot to see the whale shark passing by. The whale shark enounters in Gorontalo are in a natural environment. They are swimming around looking for schools of small fish. 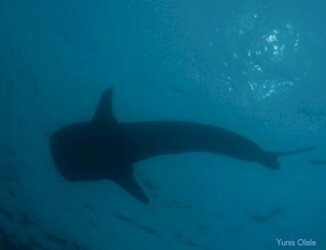 Days with a higher plankton count will also bring in the whale sharks. That is what happened the day this video was shot. Miguel’s Diving staff tell guests that if a shadow appears overhead, look up! It maybe a whale shark or a manta ray. It seems that the whale sharks are not only curious about divers but also they like the bubbles. They also like the dive boat, which has had numerous whale shark encounters of its own. Perhaps they think it is a long lost relative floating on the surface! A fantastic photo of one is available on our home page. These large pelagics can grow up to 15 meters in length. They can live up to 100 years. Judging by its small size of merely six meters, this one was probably in his early twenties.